Stephen Hawking died on March 14, 2018. He was a genius of astronomy with incredible discoveries and predictions but some of his conclusions were light years from reality. Stephen Hawking has been compared to Einstein for his genius and indeed both opened windows to the wonders of the Universe. He attested that this ‘something’ came from ‘nothing.’ This defies logic. What is the Origin of the Universe? If this is your first time at this blog, I suggest you review these previous blog posts referring to how God’s finger worked in the formation of the Universe (from the Bible whether you believe it’s fact or fiction). We have seen that the Biblical Hebrew when God ordained the stars = fashion (blog 1). Furthermore ordained = firm and stable (blog 2), garnish = royal pavilion and formation (blog 3), formed = dancing sand particles (blog 4). What we have learned from the Biblical Hebrew references to the Origin of the Universe is: The fashioning of a firm and stable heavenly canopy from swirling particles—Big Bang has begun. To fully understand Big Bang and Genesis Creation please read this mini-series of blog posts starting at the beginning. We are unlocking Bible meaning by deepening our understanding of Biblical Hebrew. We’re looking at all the contours of each Hebrew word to see how each piece is profiled and intricately assembled with other Biblical Hebrew words. We looked at garnished and formed, we now turn our attention to crooked (Strong’s H1281) and serpent (H5175) in Job 26:13. By his spirit he has garnished the heavens; his hand has formed the crooked (H1281) serpent (H5175)’ (King James Version). Here are two Strong’s definitions that will put us on the right track with deeper meaning of crooked. KJV – crooked, noble, piercing. KJV – chase (away); drive away, fain, flee (away), put to flight, make haste, reach, run away, shoot. Here’s the notion of a fleeing fugitive associated with a constellation, a cluster of stars. A fleeing constellation. Now, see how the primitive root of bariyach, H1272 adds further clarification. Our Bible highlighter illuminates a few Bible contexts that use this primitive root ‘barach.’ Notice the concept of hurrying to run away. Psalm 139:7 says ‘Where shall I go from your (God’s) spirit? or where shall I flee (H1272) from your presence?’ 1 Chronicles 12:15 indicates ‘These are they that went over Jordan in the first month, when it had overflown all his (its) banks; and they put to flight (H1272) all them of the valleys, both toward the east, and toward the west’. This formation of the ‘crooked‘ (H1281) serpent in Job 26.13 involves stars–constellations–fleeing, being driven away in all directions. In the same book of Job where we find the verse we’re analyzing, we find crooked elsewhere translated fain flee: ‘For God shall cast upon him, and not spare: he would fain flee (H1272) out of his hand (Job 27:22). The New International Version updates the English by using ‘…flees headlong from his power.’ This outward bound flight (that’s what fleeing means) is fast and furious, confirmed by the KJV translators use of: chase, drive away, make haste, run away. These Biblical concepts of particles being flung out into space and an expanding Universe are in line with cosmology and Stephen Hawking. This one Biblical Hebrew word, bariyach (H1281) and its foundational meaning barach (H1272) encompass a wealth of illumination. They reveal unsuspected variations, contours of the puzzle piece, that unlock our comprehension and give us the detailed action of the scenario. I told you each Biblical Hebrew word tells a story. Are you beginning to see the story of bariyach? 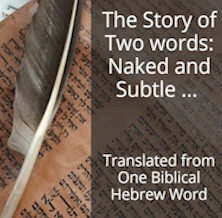 Are you beginning to grasp the concept of how Biblical Hebrew opens up comprehension? Let’s confirm the concept that ‘bariyach’–accelerated fleeing–is from a fixed point as alluded to in the last 3 verses. This outward motion from a given point is revealed in 1 Chronicles 8:13 ‘Beriah also, and Shema, who were heads of the fathers of the inhabitants of Aijalon, who drove away (H1272) the inhabitants of Gath’. The ‘fixed point’ is the city of Aijalon–the invading inhabitants of Gath were driven away–put to flight–from that point. Let’s apply this principle of reaching from side to side to how, according to the Bible story, God formed the Universe. The matter inside the pinhead isn’t just something that has moved from point A to point B, but while moving outwards, reaches from end to end filling space with stars as it grows and grows pushing outwards in all directions from a given point. We understand that ‘bariyach’ (H1281) is talking about the ‘filling in’ of the Universe as Big Bang spreads from a central point to cover a wider area. What we have here is the origin and creation of SPACE. Before Big Bang there was nothing physical. Stephen Hawking concurred with this fact. The pinpoint from which Big Bang extended was the initial ‘physical matter’ from Nowheresville (Stephen Hawking did not concur with that. He felt the physical pinhead coalesced from nothing. where and what is ‘nowheresville?’ Is this fact or fiction?) As matter spewed outwards in all directions leaving a trail of physical particles in created–filled end-to-end–SPACE. That SPACE is still expanding-extending. In fact, we know the expansion of the Universe is even accelerating, creating more and more SPACE. Scientists have no idea why or how this acceleration is possible, after all, logically, it should be slowing down! Is the meaning of ‘bariyach’ some fictitious fairy tale? Were Stephen Hawking and modern astronomy outdone by writings some 2500 years old? Or does this usage of Biblical Hebrew reveal aspects of the description of Big Bang? What’s the relationship between bariyach – crooked and serpent, the last word in Job 26.13? The final Biblical Hebrew word in Job 26:13 could reveal an exciting point. It is the word serpent (H5175), ‘…his (God’s) hand has formed the crooked serpent’ (KJV). נָחָשׁ nâchâsh naw-khawsh’; from H5172 (נָחַשׁ); a snake (from its hiss): KJV – serpent. נָחַשׁ nâchash naw-khash’; a primitive root; properly, to hiss, i.e. whisper a (magic) spell; generally, to prognosticate: KJV – ⨯ certainly, divine, enchanter, (use) ⨯enchantment, learn by experience, ⨯ indeed, diligently observe. The serpent is referring to the hissing sound it emits by exhaling air from its mouth, similar to what we do when we whistle. This same word is used in Jeremiah 46:22 ‘The voice thereof shall go like a serpent (H5175)’ with emphasis on his voice or as the NIV translates it, ‘…hiss like a fleeing serpent’. This sound is characteristic of what we discussed in Inventory, chapter 2 referring to Big Bang, which broadcasts an identifying tone called the cosmic microwave background, the very faint thermal radiation left over from the cooling of the initial immensely hot Big Bang, also referred to as the universal fossil echo due to its glow in the microwave region of the radio spectrum. This is the final piece of the Bible picture for this verse in Job. Let’s put it all together. The Biblical Hebrew word nachash has many contours and some of you will know that it refers to the ultimate ‘serpent’–the devil mentioned in Genesis 3 which we will get to in due time. However, in the context we’re discussing, in Job 26.13, it is clear the object is creation of the heavens, hence the Bible reference to the hissing sound. Remember how Biblical Hebrew can be used figuratively to help understand concepts different from what the original word specifically displays. Here’s what the Biblical Hebrew of Job 26:13 is telling us: ‘By his spirit he has garnished the heavens; his hand has formed the crooked serpent. Read superficially, the initial part of the verse indicates God decorated the skies but the rest is difficult to understand—particularly the crooked serpent. Based on on study to unlock Bible meaning we can give this verse a paraphrase makeover, it would go something like this: ‘God, through his spirit, created the glistening royal pavilion; his hand whirled out fine particles in a fleeing manner leaving what has become a universal echo.’ I wonder how Stephen Hawking would feel about that, but more importantly, what do you think, fairy tale or not? I don’t think Job fully understood what he was saying. But, thanks to science, we are beginning to see how the universe came into being, and with the help of a deeper understanding of Biblical Hebrew—that comes from various nuances of Hebrew roots as noted by the King James translators and coordinated by Strong—we can begin to grasp the relationship between the beginning of the universe God and what the Bible has to say. Our understanding expands… and we’re just beginning. Ready for some study? Today, I’m going to ask you to do the exact opposite of the type of study we’re doing! First of all, what am I doing? I’m putting Biblical Hebrew under the microscope, no, even more than that, under the electron microscope. Normally a microscope uses photons, light, to magnify, but a beam of electrons gives a much clearer view of the object. Lawrence Berkeley Labs has an electron microscope that can detail half the width of a hydrogen atom! I’m putting an electron microscope on Biblical Hebrew. Most eyes only see the Bible in their native language, They don’t even see the original, think about that. A few look at the original language and don’t get a thing; because they can’t read it, Even fewer study the Biblical Hebrew and even then fewer get down to the ‘root’ level. An agent from the Israel Institute of Biblical Studies (where I studied Biblical Hebrew) called me this week to see if I wanted further assistance. We ended up discussing Hebrew roots and their interrelationship (one of which I developed here). She had difficulty accepting that. You see, even when the object is there, and you can’t or don’t know how to use an electron microscope, details escape you. Christ said ‘one jot or one tittle shall in no wise pass from the law,’ (Matthew 5.18). The principle is that the smallest detail will always be there. In that sense, I’m explaining ‘tittles,’ the smallest of the small when it come to Biblical Hebrew roots and details. What I don’t want you to lose sight of is that God was NOT focusing on the tittles with Job and his friends. In fact it was exactly the contrary God wanted them to look up at the heavens and see how puny they are (Psalms 8.3-4). And that’s what Job ultimately ended up doing. Evidence for God is in both the vastness and the detail. It’s in the entire Universe which is far, far, far, beyond the human eye and the ‘Theory of Everything‘ (harmonizing all the details of the 4 forces that hold the Universe together) which is far, far, far, beyond the human mind. In your study this week, step out from behind my electron microscope and get behind the telescope. Read the above Bible verses and the context around them and project it on a widescreen, on a dome like in a Planetarium, get the big picture. See the Imax 360° ‘awe.’ That’s what God had in mind when He spoke these words to Job. Get the AWESOME IMAX PICTURE. Since you read all the way to here… you liked it. Please use the Social Network links just below to share this excerpt of Inventory of the Universe, Stephen Hawking: A Universe from Nothing. Correct or Incorrect?